Aussie DIY nano-filler pioneer, MagicEzy is thrilled to announce that Road Tech Marine is the latest national chain to get behind their patent-pending range of award winning, ‘fix and color’ products. MagicEzy 9 Second Chip Fix, Hairline Fix and Mega Fusion are available at all Road Tech Marine outlets around the country. MagicEzy products solve one of the biggest frustrations that boat owners face when trying to fix blemishes on their boat. According to MagicEzy CEO, Warwick Lindsay, DIY fiberglass repair is a nightmare. Normally a lot of sanding prep work is required as well as mixing multi-part solutions and color matching and it can take hours to repair one blemish. MagicEzy products solve that problem with an all-in-one, water soluble formula that not only fills in seconds, the products also have a built-in colorant which saves boat owners hours on repairs. 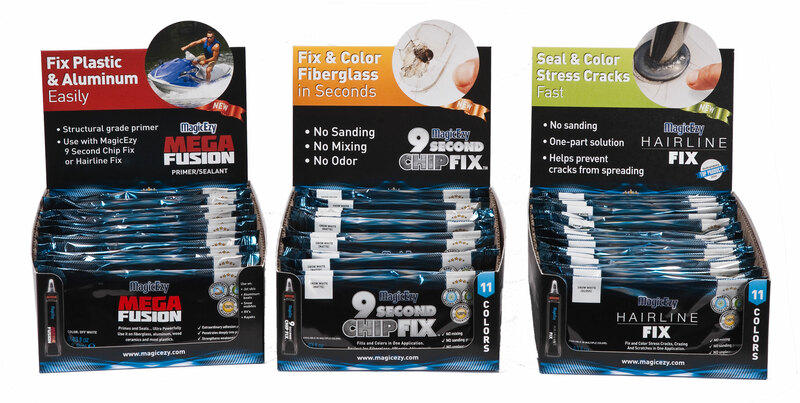 Chips, gouges, and nicks can be fixed using 9 Second Chip Fix (available in 11 colours). Hairline Cracks, gelcoat crazing and fine scratches can be repaired using MagicEzy Hairline Fix. MagicEzy even have a product for damaged plastic composites and aluminium – Mega Fusion Primer Sealant. Since opening its first store in Granville NSW in January 2013, Road Tech Marine (RTM) has achieved meteoric success with 10 stores now operating in Qld, NSW, ACT and Victoria. According to Operations Manager, Kevin Knight, Road Tech have plans to open several more stores by the end of the year. Road Tech Marine’s retail chandlery style store stocks over 4,000 product lines for owners of trailer boats, caravans, motorhomes, camper trailers, 4WD, etc. Marine parts include everything from trailer lights and wiring, rope, chain, anchors, buoys, to LED lighting, power and generation systems, and communications gear. Caravan products include covers & awnings, air-conditioning & refrigeration, kitchen, cooking & appliances, lighting & accessories, plumbing & sanitation, trailer & towing accessories, and 12V products for power management and generation. RTM stores have plenty of off street parking and are open seven days. For a list of RTM stores please visit the website https://www.roadtechmarine.com.au/.